Robin, always a Paragon man at heart, came back to his first club, bringing with him Ron Smith, Dave McLean, Pete Carlton, Mick Hardy, Collis Hemstock, Spike Austin and myself. Almost at the same time the Ilkeston club, Erewash Valley R.C., disbanded and useful members like Dave Charlton, Barry Minchin, Jammy Jeffries and Snowy 'Pride of Romorantin' Newton were acquired by the Paragon. All this happened around 1960/61 and started the Paragon's rise to be one of the strongest clubs in the district. With the new influx of riders, Robin retired from racing and took on official club work, leaving Dave McLean to keep the Paragon's name in cyclists' minds. Right from his early days of 'Open' wins to present day team support, Mac has always been a useful rider and this coming season hopes to concentrate on the longer distances. During recent years, top riders like Gordon Booty from the disbanded Ericsson Wheelers and Pete Stark, ex Nottingham Phoenix 'flyer', gave the club its fair share of publicity which brings us to its best ever year, 1966. It all started in March 1966, when ex Scottish Champion and B.A.R. runner up, Andy Kirk, walked into the clubroom one Tuesday evening after being chatted up by Terry Collishaw at a local early season '25'. Andy had just come down from Scotland to work in Nottingham, but he was already well known south of the Border for his time trialling. It was possible to sense the 'start of something big' in the clubroom that night, and finally Gordon Booty came out with "I've always wanted to win the National '100' team with the Paragon". I thought he was joking, but he meant it. But who was to be the third man? Well you all know now that it was to be big Nick Copeman who has gone from strength to strength and one day will startle the cycling world - even if its only for the way he trains! Gordon Booty's best ride of the season was definitely in leading the club to a National '100' team win, when in atrocious conditions he put on the pressure in the last 25 miles when every other rider either packed or was reduced to crawling, to record 4.18.50 for 7th place. Andy Kirk's most satisfying ride must surely be his 1.58.02 victory in the Barnsley R.C. '50' in a thunderstorm, which gave the club its first sub 2 hour ride. Andy, who had gained wins back in Scotland in Paragon colours said after this race "It wasnee th' rain that bothered me, but th' leetning freetned mi ti deth". Nick Copeman's 'out of the blue' 1.52.10 '50' at the end of the season was proof of his fitness and should keep it in the club's record book for some time. These riders throughout the season triggered off other great rides, when Pete Stark came second to the National Champion Dave Dungworth with a short '55' - you can't do better than that! This season we could see Pete as the new '25' champ, he's got the mental approach and speed - let's hope 'Cycling' tips him this year and they are right this time. Road racing has not always been the Paragon's strong side of the sport, but Alan Hitchcock has consistently been the club's top rider. One of the most exciting finishes I saw last season was his 3rd place in the East Mids. Divisional Championship, when 'Scratch' rode a well judged race. In the final gallop he put up a terrific sprint only to be pipped by B Bailey (Beeston R.C.) and Hobby (Newark Castle) who had got away from the bunch. This season should see Scratch with some strong team support and possible individual and team wins. The Paragon tried everything in 1966 from track to 24 hour racing, which brings me to the Mersey R.R. 24 hour, where I offered to help Geoff Toon and Johnny Barton on their all day rides. Johnny had ridden a '24' before, but Geoff was new to this kind of racing, so the former was really clued-up on the situation and knew exactly what he would be getting for breakfast! Although the conditions during the ride through the night were good, the following day was wet and windy and Geoff's total of 416 miles and John's 409 miles were worthy rides. Birmingham St. Christophers won the team, but one thing is clear, I am sure that the Paragon is capable of a team win in this race, as Geoff beat two of the St Chris's and Johnny beat one, all of whom were long distance record holders. All we need is a third man - any offers? Although a gruelling race, I think the helpers suffer as much as the riders, but I hope to go back to Cheshire for this years event. It is a long time since a lady had her name on the prize list, but 1966 saw the emergence of Carol Barton, after several years lay-off, who completely dominated the short distance events in the Central District. Carol hopes to ride 50's and a 100 this year so we should see her name in the Ladies B.A.R.  The club can boast seven riders who managed to get under the hour last year, those already mentioned (P Stark, D McLean, G Booty, A Kirk, N Copeman) plus 'Jammy' Jeffries and Ian Horwood. 'Jammy', who everyone will agree is one of the most stylish riders around today, and who could, with more racing events, be easily amongst the prizes. Ian Horwood, back with the club after a spell with Oldbury & District C.C. is a useful team member at both 25 and 50 miles. Although the riders mentioned have given the Paragon either individual or team successes in 1966, it has been a good year for all members. For example, look at the large number who tackled the Nottingham - Skegness race, and good turn outs for end of season club runs. They have all helped to make the Long Eaton Paragon C.C. known both by their keenness and strength in numbers (36 members racing, and had the largest number of entries for the years B.D.C.A. events). Can the club, therefore, in 1967 look forward to a B.A.R. team win, or an individual '25' mile champion, a 24 hour team win or a grip on a schoolboy race after the thriving number of schoolboys who have joined. Perhaps the emergence of a strong road team or a top 'vet' in Ted Jacobs. If only one of these come off, and it is possible with the talent in the club, then it will give satisfaction not only to the individual rider, but to the other members who will be proud to belong to the Paragon! As a last thought, how about the Barson brothers (the Dynamic Duo) on their tandem to challenge Thompson - Cooke for the championship.